Our newly issued Alcohol Beverage Control (ABC) taproom license allows us to sell Central Coast wines, ciders and the ability to bring in guest taps that our staff feels are amongst the best beers the area has to offer. This new change means we can no longer fill growlers, however we will be offering more beers to go in 22 ounce bottles. Drink & draw? pints & palettes? nope… how about brushes and beers? 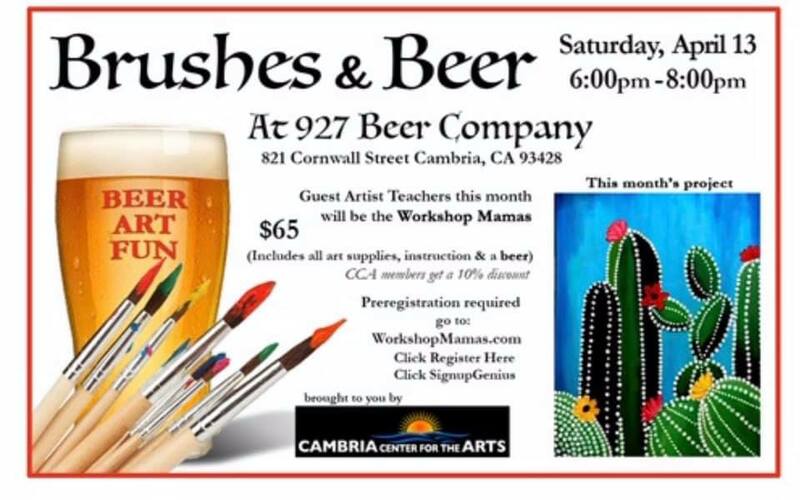 Come on down to the 927 Beer Company and join us for a fun evening of painting and beers, ciders & wines. Head over to the WorkshopMamas.com, or head to the 927 Beer Company Facebook page to find more info. Space is limited so please reserve your spot today! 927 Beer Company along with Madelines Restaurant are joining forces to deliver a memorable dining experience. This is our 7th annual Beer Maker Dinner. What we do is take over Madelines Restaurant for the evening. 50 spots are available and it will sell out well in advance. Chef David puts together a fantastic menu and we pair it with 927 Beer Company beers. Appetizer- baked brie, bourbon stout cream, toast points. Soup- potato and pale ale. Salad- butter lettuce, raspberry vinaigrette, goat cheese, red onion, hazelnuts. Entree- smoked duck cannelloni or smoked mushroom cannelloni for veg people. March 23rd: We will have Resination, the best local reggae band in the county. More artists/bands to be announced at a later time. We will also have the HURRICANE KITCHEN food truck. March 24th: Rough House will be playing for us. We will have one or two more bands/artists this day as well. Food truck on Sunday is The Pairing Knife, they have been here before and they didn’t disappoint. THIS YEARS THEME IS SAISONS. We will have a couple different saisons to present to you. We will also have COMATOSE, our anniversary ale. Comatose is an 11+% abv Triple IPA. More information to come… please check back. $10 cover charge and it includes a BEER! 7th anniversary party. March 23rd and March 24th 2019. Save the date, mark your calendars, do what you have to do so you do not miss this event. We will have food trucks, live music, and as always several special beers brewed to honor our birthday.